In an age when the works of &"New Atheists&" such as Christopher Hitchens and Richard Dawkins fill bookstores and top best-seller lists, the topic of Christian apologetics has never been more timely. Yet the thought of defending the faith against the attacks of unbelievers is daunting to many Christians. 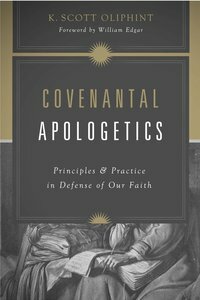 Following in the footsteps of groundbreaking apologist Cornelius Van Til, Scott Oliphint has written an accessible introduction to Reformed apologetics, explaining the biblical and theological principles behind a distinctly &"covenantal&" approach and offering practical guidance for interacting with and persuading those who don&'t believe. Written for leaders and laypeople alike, this book will encourage and equip Christians to boldly proclaim the gospel and answer the challenges of skeptics in an increasingly skeptical world. Customer Reviews For "Covenantal Apologetics"
This volume is intended as an introductory work to presuppositional apologetics. It serves its purpose well, explaining the system through exposition and sample dialogue. Unfortunately some parts are unhelpfully repetitive, such as unnecessary repetition of qualifications that the dialogue is limited, and repeated summaries of the same point. Overall, a helpful introduction, though readers will want to go on to other books for further exploration.